After 4 grueling months of battling it out with 32 bands the winner of the 2015 Quay 4 Battle of the Bands has been announced! 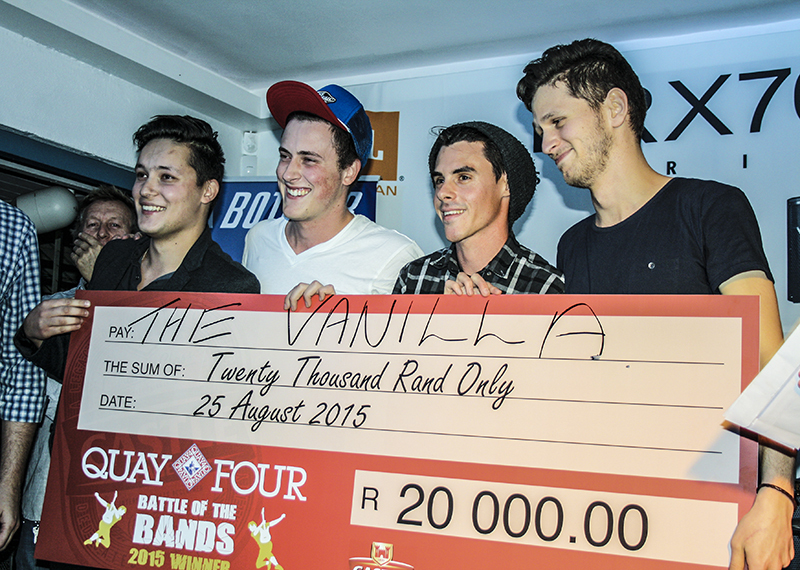 Congratulations to The Vanilla who take home the R20, 000 grand prize along with a 3 month playing contract at Quay 4 and 2 JBL monitors compliments of Wild & Marr!! 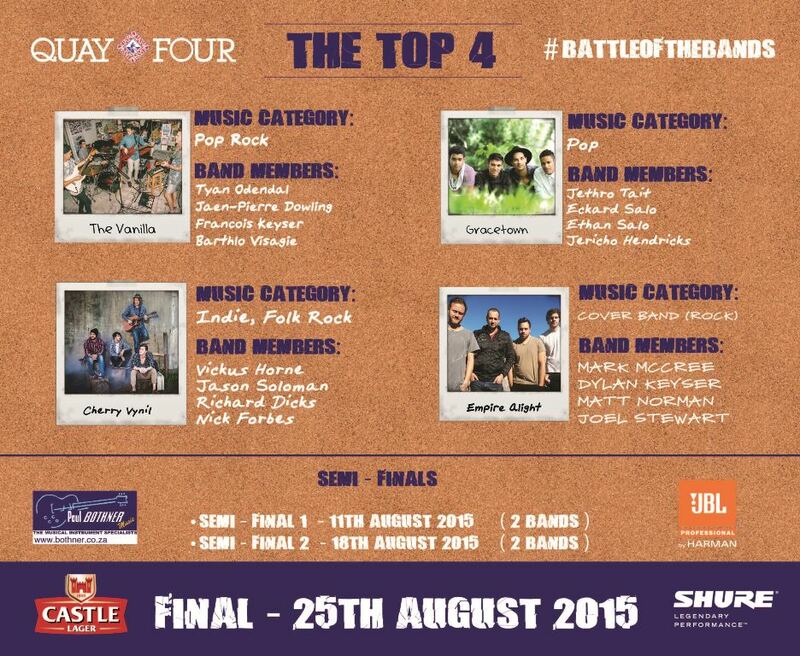 The 2015 Quay 4 #BattleoftheBands has been a massive success with four truly talented bands reaching the Semi-Finals! Congratulations to the top 4 bands: Gracetown, Cherry Vynil, The Vanilla & Empire Alight! With the finale on the 25th of August where the R20, 000.00 cash prize and other amazing prizes will be handed out. 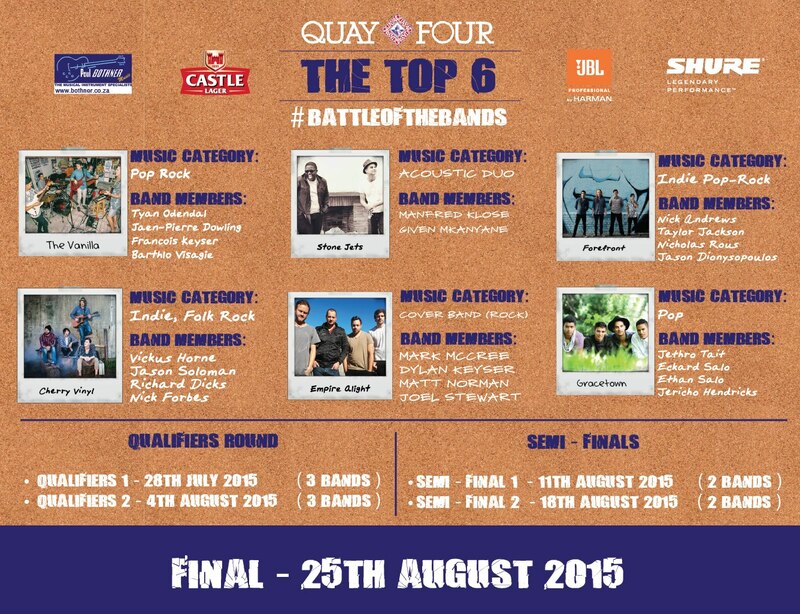 Book your table for the final of the Battle of the Bands now to avoid disappointment: info@quay4.co.za | 021 419 2008. Congratulations to all the bands qualifying to phase 2. P.S. Phase 2 program to be posted on Battle of the Bands Facebook page – confirming your appearance date ! Quay 4 Battle of the Bands 2015! Every Tuesday evening with the finale on 25 August! For more info go to our Facebook Battle of the Bands Page!! 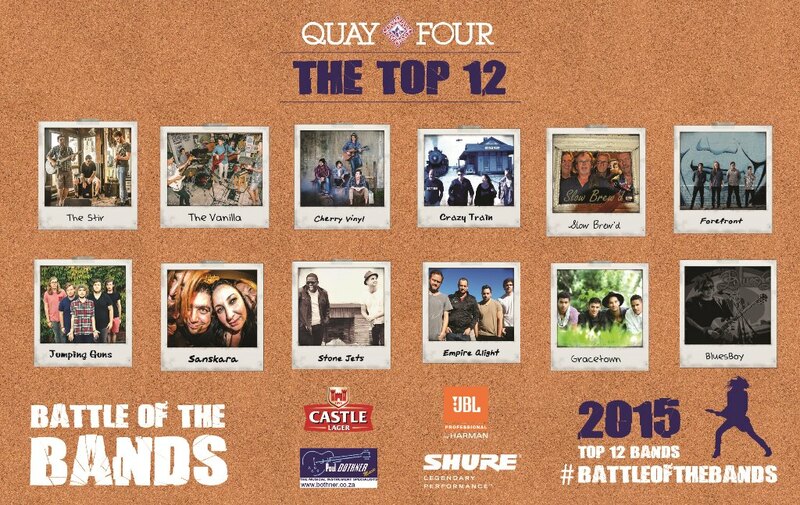 Congratulations to the following bands that have made it into the Quay 4 #BattleoftheBands! Please note the above listing is in no specific order! Bands from all over the Cape will battle it out May to August, every Tuesday evening with the finale on 25 Aug 2015! A three month playing contract at Quay 4 and a R20 000 cash prize compliments of Castle Lager. 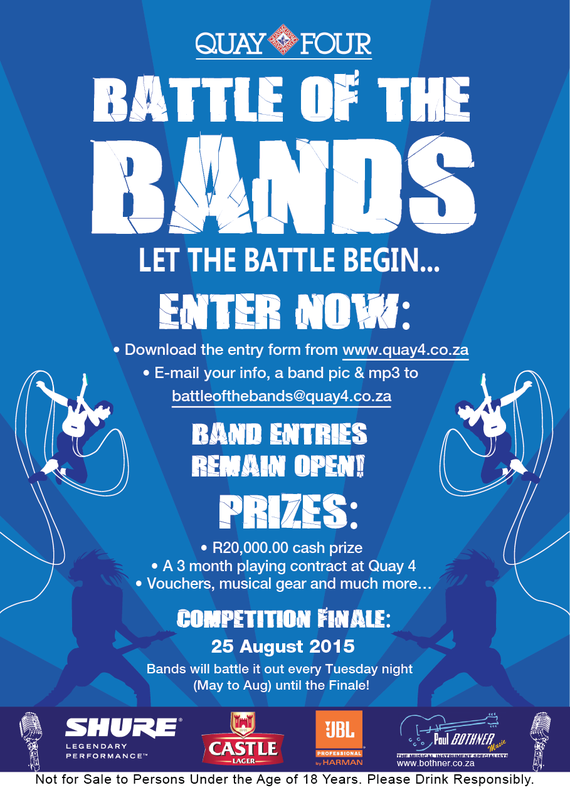 Quay Four Battle of the Bands opens for band submission from 1 April 2015 and finishes at 23H00 on 30 April 2015. The competition runs from 5 of May until 28 July 2015 on every Tuesday evening. Quarter finals will take place on the 4th and 11th of August, semi finals on the 18th of August and the final on 28 August 2015. By entering, each band has made itself available to perform on the 4th,11th, 18th and 25th of August 2015 should they advance to the quarter, semi or final stages of the competition. Microphones, guitar amp, base amp, drum kit (excluding cymbals), instrument DI’s, speakers and sound technician will be provided by the organizers. Any additional instruments or equipment must be supplied by the band. Bands must adhere to the performance time allowance of 20 minutes and change over time of 15 minutes. 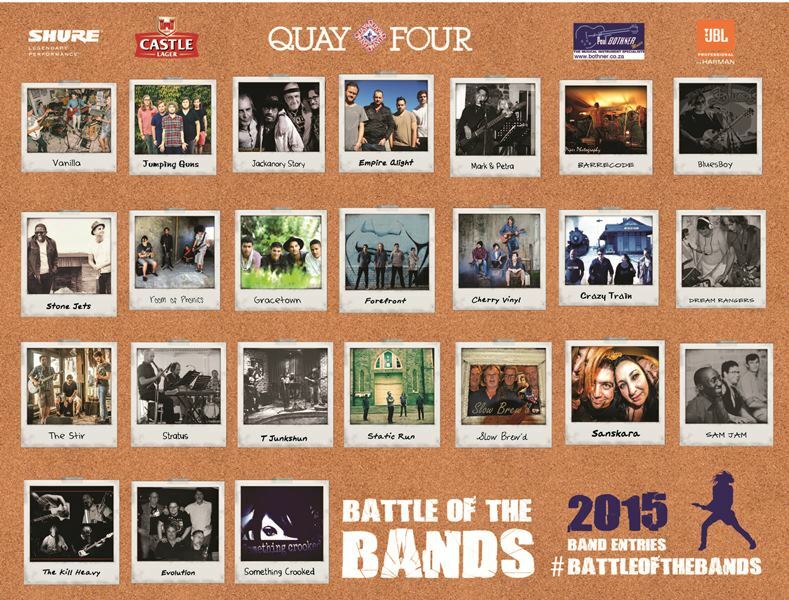 Bands who have won a slot to compete in the Quay Four Battle of the Bands will be announced via the Quay Four Battle of the Bands webpage and Facebook page on the 1st of May 2015. All bands will also be notified via email. Bands advancing to the quarter finals will similarly be notified on 29 July 2015, semi finals on 12th of August and finals on 19th August 2015.